Google recently surprised many by creating a new google search engine results page. This has a significant impact on Google’s bottom line but more importantly the budgets and bottom lines of those who advertise using Google’s PPC and Adwords. 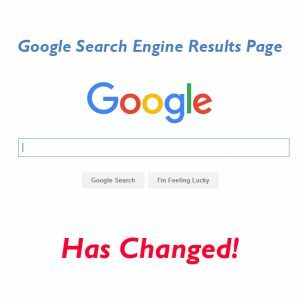 The changes in the new Google Search Engine Results Page will have a significant impact on digital marketers using Pay per Click (PPC) and Adwords. It is really only worthwhile to bid for Google’s first few pages, because most people only look as far as the first few Google search engine results pages. For two reasons, a) they find links, sponsored ad or organic search that they like, and off they go, and b) if within the first few pages they haven’t found what they are looking for, they’ll more often than not change the key word or key phrase and do another Google search. You can argue whether the first few pages means 2, 5, 10 or more, but you get the point. So if you use Adwords and you you are bidding for instance for your sponsored search ad to be shown on the first results page, before the changes, you may have had (hypothetically to keep things simple) 100 vendors bidding for 10-12 slots. The SERP would show 2-3 ads on top of the organic search list and 9-10 slots in the right side bar, plus 2-3 ads above the footer. In the new Google search engine results page the side bar is gone, you have (hypothetically again) 100 vendors (i.e. marketers) bidding for 3-4 slots plus 2-3 slots above the footer of the page. On some occasions when you type in Boston Museums in the search bar, Google shows a gallery of pictures from Boston museums and only 1 ad near the top, plus 3 ads above the footer. The key point of the impact of the new Google search engine results page is the financial impact on the vendor’s budget, the digital marketer’s budget. The more people are bidding for less slots the higher the price will be driven in the process. Think about you and 20 more people bidding for a great house….you’ll be in a bidding war before you know it and often are willing to pay more than market value. Provided of course it is a strong market. 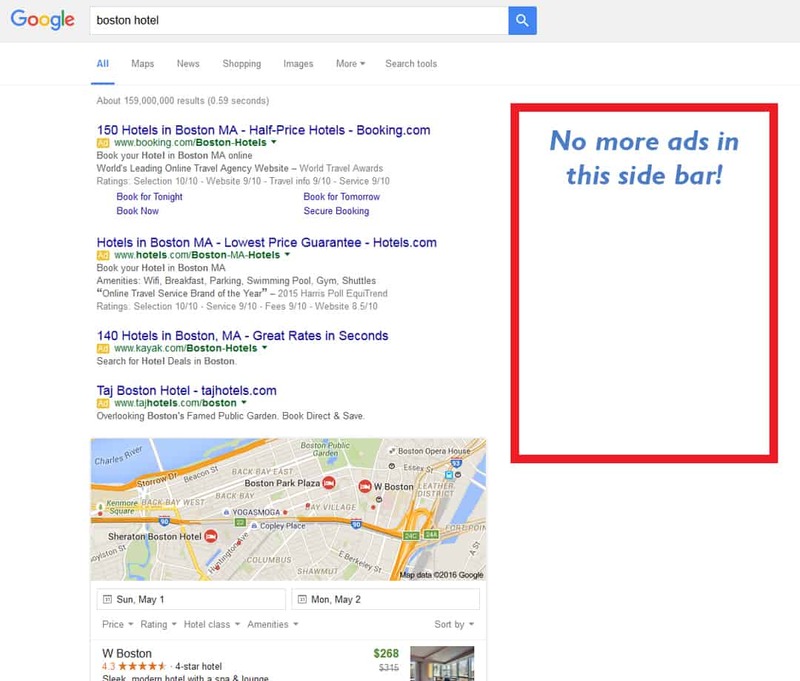 Whether it is Google’s intention to drive the ad slot prices up is to be seen. If you have the space to place ads, why not use it and drive the prices up in a different way. My guess is that thinking about making Search Engine Results Pages (SERP’s) “mobile friendly” may have played a role as well. For Digital Marketers: So Now What!? Here is a short list of things to look for. I will elaborate in different articles. Social media – get the word out through social media posts to reach the same target group you would by advertising. Make sure any posts link back to your site to improve your SEO ranking. Email-Marketing – send more emails to your target group. Don’t overdo it or you’ll end up in spam. White-papers – Write “white-papers” about the product or service you are selling. Webinars – Create podcasts or webinars about topics relating to your product or service. Images and Videos – Create viral images or videos related to what you publish on your site. Local – Take advantage of Google Local, Yahoo local and alike. If you want to stay up to date with digital marketing and web design developments, trends, tips and news, you can sign up for our news letter by clicking here, or contact us with any questions by clicking here.